Mark and Mary Devlin are the founders of Newslines. 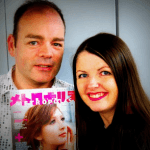 Born in Scotland, Mark and Mary moved to Japan in 1989. In 1993 they started handing out a four-page classified ads sheet on Tokyo streets. Over 14 years that sheet grew into Metropolis, Japan’s No 1 English Magazine. In 2000 they founded japantoday.com, the No. 1 news and discussion site about Japan in English. In 2007 Mark & Mary sold their businesses and moved to the United States where they opened Kroaky’s, a private karaoke room business. In 2014 they launched Newslines, an innovative news timeline site. They have two children and now live in Glasgow, Scotland. Mark creates Sweepr, an iPhone game (currently not available). Japan Today is launched as a rival to Japan’s English language newspapers. Over the next year the site will become the most popular news site about Japan in the world, regularly hovering around the top 5000 sites in the world. Japan Today is the first news site in the world to have reader comments directly under the news articles. Before then the readers had always been forced into the forum area of the site. There was just no information in English.